Price: 1,256.00 USD* /1,650.00 CAD*/ 1.300,00 EUR** Price depends on current Euro-dollar exchange rates. The Midewiwin drum is a living entity given life through the spirits of the wood and the animals that fashioned it, and through the energy that the drum maker put in its construction. The drum, when played, communicates with the natural world and, through that, with the realms of the supernatural, and by beating its rawhide membrane and producing sound from it, the Mide invokes the presence of, and makes himself heard to, the MIDE-MANIDOOG, thus enabling him to actively promote bimaadiziwin (prolonging human life) through that communication. 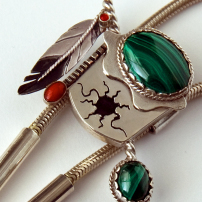 Woodland Art jeweler Zhaawano created this silver bolo tie, a sterling silver slide attached to a silver snake chain lanyard, the slide featuring the stylized image of the Sun, symbol of Great Mystery. The green of the large oval malachite stone cabochon adorning the drum head stands for Omizakamigokwe, the Earthmother, source of all life; the smaller malachite stone placed in the head of the drumstick denotes innocence in the heart of the People. 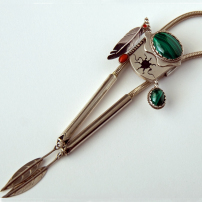 A silver rattle design is attached to the side of the drum body and set with an oval red coral cabochon representing the campfires of the People and the Seven Prophecies that the Great Mystery bestowed long ago on the People, and the Migizi miigwan (eagle feather) hanging from the drumstick handle symbolizes the spiritual aspects of Midewiwin healing practices. 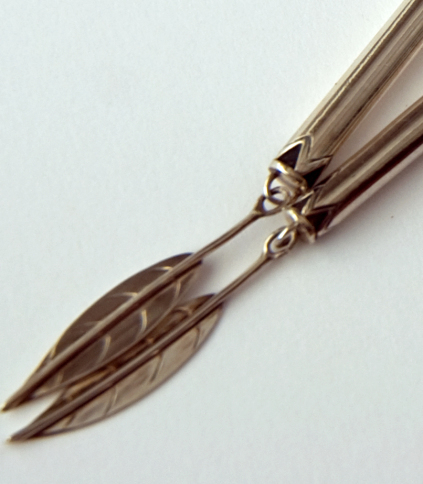 Lastly, the silver bangle tips at the ends of the silver lanyard (see image) show a Thunderbird's lightning pattern (which can also be interpreted as the zigzag trail of the otter, symbol of Mide Medicine), and two stylized leaves representing the Plant and Tree world. 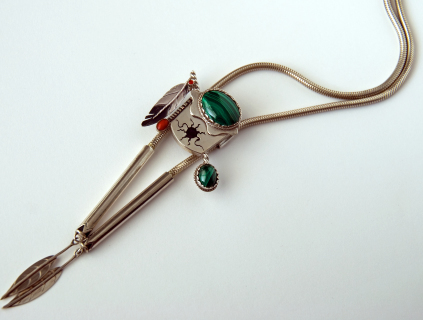 For further reading about the symbolism of this bolo tie, please go to our art blog.